With fired FBI Director James Comey's highly anticipated congressional testimony just a day away, the White House and its allies are scrambling for ways to offset potential damage. Asked Tuesday about the testimony, President Trump was tight-lipped: "I wish him luck," he told reporters. And early Wednesday, Trump took to Twitter to announce his pick for FBI director — Christopher Wray, a former Justice Department official who was New Jersey Gov. Chris Christie's lawyer during the George Washington Bridge lane-closing investigation. 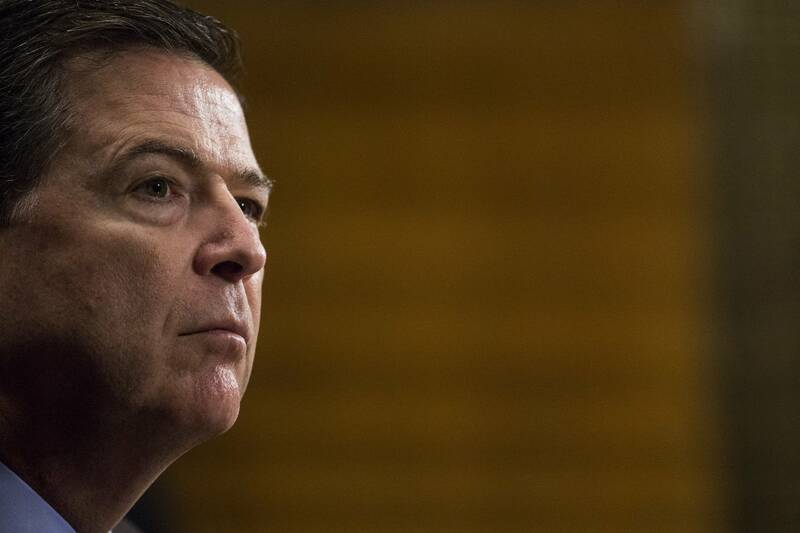 Comey's testimony Thursday before the Senate intelligence committee could expose new details regarding his discussions with Trump about the federal investigation into Russia's election meddling. Comey could also bring up other aspects of his dealings with the Trump administration. On Tuesday evening a person familiar with the situation said Comey had told Attorney General Jeff Sessions that he did not want to be left alone with Trump. The person, who was not authorized to discuss the matter by name and spoke on condition of anonymity, told The Associated Press the comment was made because of concerns Comey had about Trump. It was not immediately clear when the conversation occurred. But The New York Times, which first reported the interaction with Sessions, said it came after Trump had asked Comey in February to end an FBI investigation into Trump's first national security adviser, Michael Flynn. Justice Department spokesperson Ian Prior declined to comment. He said Sessions "doesn't believe it's appropriate to respond to media inquiries on matters that may be related to ongoing investigations." Trump's White House and its allies are crafting a strategy aimed at undermining Comey's credibility. Both White House officials and an outside group that backs Trump plan to hammer Comey in the coming days for misstatements he made about Democrat Hillary Clinton's emails during his last appearance on Capitol Hill. The Republican National Committee has been preparing talking points ahead of the hearing, which will be aired live on multiple TV outlets. An RNC research email Monday issued a challenge to the lawmakers who will question Comey. There's bipartisan agreement, the email says, that Comey "needs to answer a simple question about his conversations with President Trump: If you were so concerned, why didn't you act on it or notify Congress?" Comey's testimony marks his first public comments since he was abruptly ousted by Trump on May 9. Since then, Trump and Comey allies have traded competing narratives about their interactions. The president asserted that Comey told him three times that he was not personally under investigation, while the former director's associates allege Trump asked Comey if he could back off an investigation into Michael Flynn, who was fired as national security adviser because he misled the White House about his ties to Russia. Democrats have accused Trump of firing Comey to upend the FBI's Russia probe, which focused in large part on whether campaign aides coordinated with Moscow to hack Democratic groups during the election. Days after Comey's firing, the Justice Department appointed a special counsel, former FBI Director Robert Mueller, to oversee the federal investigation. The new revelation about Comey's uneasiness with Trump brings to mind a posting last month by Comey friend Benjamin Wittes on his Lawfare blog, in which he said Comey "saw it as an ongoing task on his part to protect the rest of the Bureau from improper contacts and interferences from a group of people he did not regard as honorable." Despite the mounting legal questions now shadowing the White House, Trump has needled Comey publicly. In a tweet days after the firing, he appeared to warn Comey that he might have recordings of their private discussions, something the White House has neither confirmed nor denied. White House officials appear eager to keep the president away from television and Twitter Thursday, though those efforts rarely succeed. White House spokesperson Sean Spicer said the president plans to attend an infrastructure summit in the morning, then address the Faith and Freedom Coalition's "Road to Majority" conference at 12:30 p.m.
"The president's got a full day on Thursday," Spicer said. The White House had hoped to set up a "war room" stocked with Trump allies and top-flight lawyers to combat questions about the FBI and congressional investigations into possible ties between the campaign and Russia. However, that effort has largely stalled, both because of a lack of decision-making in the West Wing and concerns among some potential recruits about joining a White House under the cloud of investigation. "If there isn't a strategy, a coherent, effective one, this is really going to put us all behind the eight ball. We need to start fighting back. And so far, I don't see a lot of fight," said Barry Bennett, a former Trump campaign aide. Still, Trump supporters say they are willing to step in to help the White House deflect any accusations from Comey. "If we feel he crosses a line, we'll fire back," said Ed Rollins, chief strategist of Great America PAC, the political arm of the group airing the Comey ad.